Catholic News World : FULL TEXT Letter of Pope Francis to US Bishops on Retreat in Response to Abuse Crisis "The hurt caused by these sins and crimes ..."
FULL TEXT Letter of Pope Francis to US Bishops on Retreat in Response to Abuse Crisis "The hurt caused by these sins and crimes ..."
USCCB Release: WASHINGTON— The U.S. Bishops have received a letter from Pope Francis as they gather in northern Illinois at Mundelein Seminary this week. 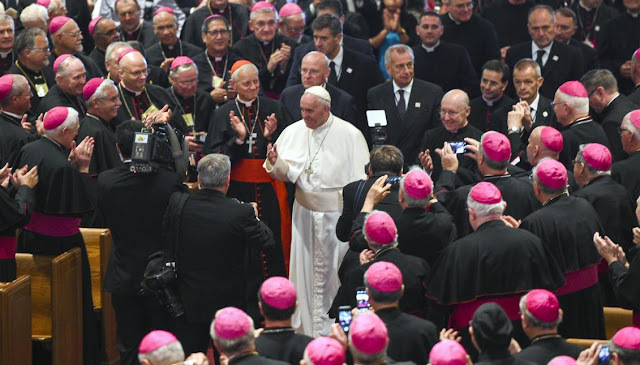 The weeklong retreat is taking place at the invitation of Pope Francis who has asked all bishops in the United States to pause in prayer as the Church seeks to respond to the signs of the times. The Preacher to the Papal Household, Capuchin Friar Father Raniero Cantalamessa, O.F.M. Cap., is directing the retreat under the theme of “He appointed Twelve, to be with Him and to Send Out to Preach” based on Mark 3:14. The structure of the retreat includes time for quiet reflection, including silent meal times, daily Mass, time for personal and communal prayer before the Blessed Sacrament, vespers, and an opportunity for confession. No ordinary business is being conducted during the retreat. Mundelein Seminary, located on the campus of the University of St. Mary of the Lake, is the principal seminary and school of theology for the formation of priests in the Roman Catholic Archdiocese of Chicago and educates nearly 200 seminarians from 34 dioceses across the country and around the world. The loss of credibility also raises painful questions about the way we relate to one another. Clearly, a living fabric has come undone, and we, like weavers, are called to repair it. This involves our ability, or inability, as a community to forge bonds and create spaces that are healthy, mature and respectful of the integrity and privacy of each person. It involves our ability to bring people together and to get them enthused and confident about a broad, shared project that is at once unassuming, solid, sober and transparent. This requires not only a new approach to management, but also a change in our mind-set (metanoia), our way of praying, our handling of power and money, our exercise of authority and our way of relating to one another and to the world around us. Changes in the Church are always aimed at encouraging a constant state of missionary and pastoral conversion capable of opening up new ecclesial paths ever more in keeping with the Gospel and, as such, respectful of human dignity. The programmatic aspect of our activity should be joined to a paradigmatic aspect that brings out its underlying spirit and meaning. The two are necessarily linked. Without this clear and decisive focus, everything we do risks being tainted by selfreferentiality, self-preservation and defensiveness, and thus doomed from the start. Our efforts may be well-structured and organized, but will lack evangelical power, for they will not help us to be a Church that bears credible witness, but instead “a noisy gong, a clanging cymbal” (1 Cor 13:1). In a word, a new ecclesial season needs bishops who can teach others how to discern God’s presence in the history of his people, and not mere administrators. Ideas can be discussed but vital situations have to be discerned. Consequently, amid the upset and confusion experienced by our communities, our primary duty is to foster a shared spirit of discernment, rather than to seek the relative calm resulting from compromise or from a democratic vote where some emerge as “winners” and others not. No! It is about finding a collegial and paternal way of embracing the present situation, one that, most importantly, can protect those in our care from losing hope and feeling spiritually abandoned. This will enable us to be fully immersed in reality, seeking to appreciate and hear it from within, without being held hostage to it. A personal and collective awareness of our limitations reminds us, as Saint John XXIII said, that “it must not be imagined that authority knows no bounds”. It cannot be aloof in its discernment and in its efforts to pursue the common good. A faith and consciousness lacking reference to the community would be like a “Kantian transcendental”: it will end up proclaiming “a God without Christ, a Christ without the Church, a Church without its people”. It will set up a false and dangerous opposition between personal and ecclesial life, between a God of pure love and the suffering flesh of Christ. Worse, it could risk turning God into an “idol” for one particular group. Constant reference to universal communion, as also to the magisterium and age-old tradition of the Church, saves believers from absolutizing any one group, historical period or culture within the Church. Our catholicity is at stake also in our ability as pastors to learn how to listen to one another, to give and receive help from one another, to work together and to receive the enrichment that other churches can contribute to our following of Christ. The catholicity of the Church cannot be reduced merely to a question of doctrine or law; rather, it reminds us that we are not solitary pilgrims: “If one member suffers, all suffer together” (1 Cor 12:26). This approach demands of us the decision to abandon a modus operandi of disparaging, discrediting, playing the victim or the scold in our relationships, and instead to make room for the gentle breeze that the Gospel alone can offer. Let us not forget that “the collegial lack of a heartfelt and prayerful acknowledgment of our limitations prevents grace from working more effectively within us, for no room is left for bringing about the potential good that is part of a sincere and genuine journey of growth”. Let us try to break the vicious circle of recrimination, undercutting and discrediting, by avoiding gossip and slander in the pursuit of a path of prayerful and contrite acceptance of our limitations and sins, and the promotion of dialogue, discussion and discernment. This will dispose us to finding evangelical paths that can awaken and encourage the reconciliation and credibility that our people and our mission require of us. We will do this if we can stop projecting onto others our own confusion and discontent, which are obstacles to unity,  and dare to come together, on our knees, before the Lord and let ourselves be challenged by his wounds, in which we will be able to see the wounds of the world. Jesus tells us: “You know how among the Gentiles those who seem to exercise authority lord it over them; their great ones make their importance felt. It cannot be like that with you”. IGNATIUS OF LOYOLA, Spiritual Exercises, 135. Cf. JORGE M. BERGOGLIO, Las Cartas de la Tribulación, 12. Ed. Diego De Torres, Buenos Aires (1987). Cf. JOHN XXIII, Pacem in Terris, ed. Carlen, 47. PAUL VI, Ecclesiam Suam, ed. Carlen, 85. PAUL VI, Ecclesiam Suam, ed. Carlen, 87. MOTHER TERESA OF CALCUTTA, as cited in Gaudete et Exsultate, 107.